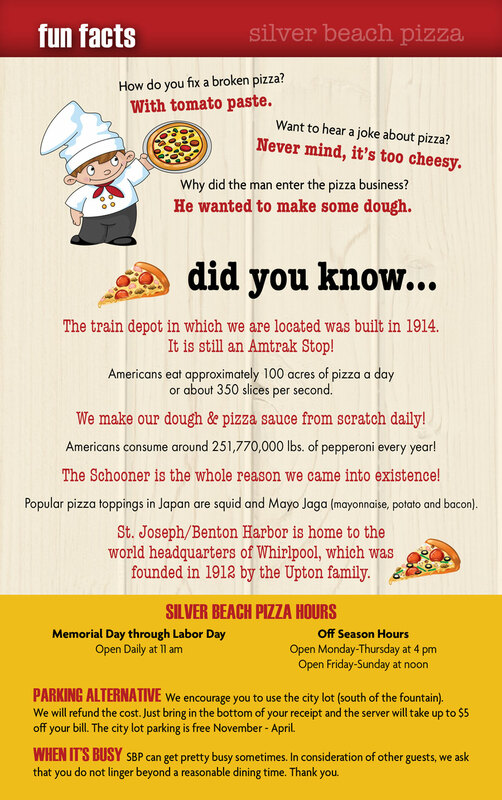 In 2003 the future owners of Silver Beach Pizza were on vacation. Jay and Tony went to a “locals” tavern in a nearby harbor and ordered a draft beer. The bartender reached down into a chest freezer, pulled out a frozen schooner, filled it with cold draft beer and set it in front of them. The most beautiful beer presentation the boys had ever seen was staring back at them. The “fog” was cascading around the glass and ice was forming on the outside. They got excited about someday serving beer to people like that and talked about it often. Pizza wasn’t even a topic of conversation yet; it was all about the beer presentation. Tony owned a place in Saint Joseph and has loved the location. When he saw that the historic Amtrak Depot became available, the idea of opening it as a pizza place took shape. They obtained the lease in August, 2005. That ice cold schooner found a home alongside a really great pizza at Silver Beach Pizza. We are proud to be associated with Gelsosomo’s Pizza. Our pizza has repeatedly been voted best pizza in Southwest Michigan. Tom Gelsosomo, YOU ROCK! The Upper Deck is an elevated structure that is a separate area from the downstairs dining at Silver Beach Pizza. The Upper Deck is adults only (21 and over – no babies please) and is reservations only. The Upper Deck has seating for about 60 and has its own bar. The largest reservation that can be made is 12. If you are having trouble getting a table for a certain day, that means we are full. Reservations can be made up to 2 weeks ahead of time. Note: Stairway access only to upper deck. Upper deck is 21 and over only – no babies please. Also please do not bring more people than you make a reservation for. Our seating is limited and most of our tables are not movable. Thanks! We do have a parking lot but it can be a bit of a nightmare. It is long and skinny with one entrance. We STRONGLY recommend you try to avoid it! There is a city lot just west of us. It is free during the off-season and $5-10 otherwise. If you bring the little tear-off from the receipt, we will take $5 off your bill (like a coupon). You can also park on the bluff and walk down.